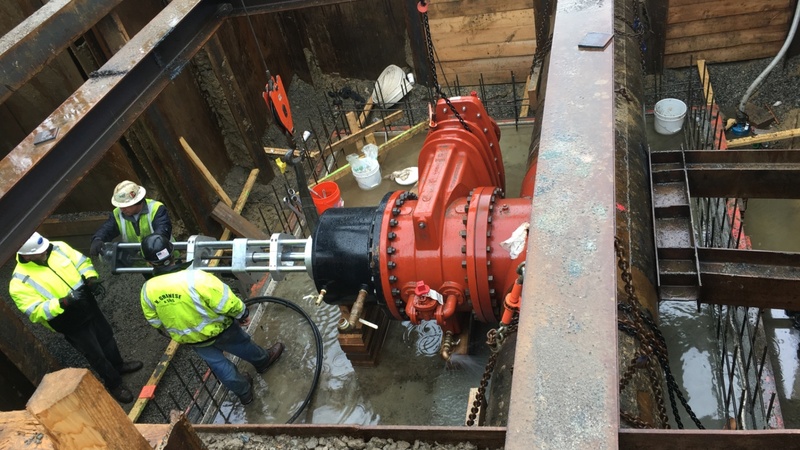 In May, SSPLS performed two 20” x 8” taps on the City of Taunton’s 20″ P.C.C.P (Prestressed Concrete Cylindrical Pipe) on Bay Road on a water main replacement/rehabilitation project for A. Andreassi and Sons. This pipe is one of the City’s main transmission lines and we have performed work on this line in the past. In 2002, we furnished and installed two 20-inch linestops on this pipe for a Mass DOT bridge project in conjunction with water main replacement over the bridge. Taunton’s PCCP is factory made and since we had previously worked on the pipe, there were no surprises. No de-pressurization was required during the cutting of the pre-stress wires and the steel cylinder was in great shape. Since the temperature was conducive to curing, we were able to perform all of the work and tap both in two days.